I just had the honor of presenting the keynote speech “An Up to the Minute Survey of Market Needs and Trends” to the 1,200 children’s books writers at the amazing Society of Children’s Book Writers and Illustrators International Conference today. That’s me in the photo there, on one of the two big screens behind the podium. I’m indebted to the many industry insiders who were so generous about sharing the view of the children’s book market from their seats. 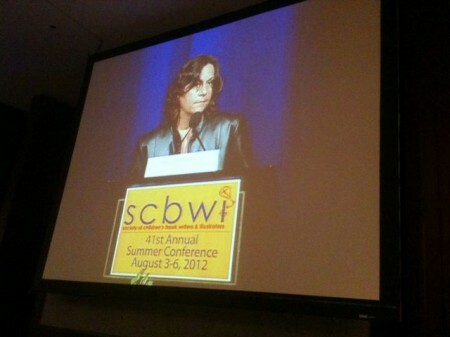 SCBWI’s official conference blog posted some highlights from the talk: http://bit.ly/PUnTAo. And may I just say, Team Blog is doing a stunning job of covering a truly immense conference. I’m so thrilled to be part of SCBWI’s efforts to help writers advance their craft and careers. Congrats Deborah! I have been following the SCWBI conference on Twitter and kidlit blogs I can’t wait to read your market report, there are snippets being tweeted in cyber space and it sounds amazing! Congrats again!.